Jenny has a studentship from the SEAHA (science and engineering in arts heritage and archaeology) Centre of Doctoral Training funded by EPSRC to undertake heritage science research. 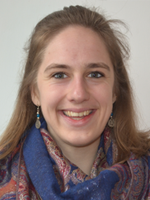 Jenny read Geography at Oxford University and has an MRes in heritage science from UCL. She has also undertaken research at Adelaide University. Jenny's project is aiming to investigate the use of site-scale, natural approaches to preventive conservation of earthen heritage sites in NW China. Earthen heritage sites are deteriorating rapidly, often in response to climatic hazards such as storms, and their resilience in the face of future environmental change could be low. Previous conservation efforts have included consolidants, drainage system and sheltering but have had mixed success. A combination of fieldwork and modelling will be used to investigate future methods for earthen heritage conservation. Jenny's project is undertaken in partnership with the Dunhuang Academy and the Getty Conservation Institute through the SEAHA CDT.